In "dynamic SIMS" mode the primary ion beam exceeds the "static limit" (~1E12 ions/cm2) producing a high yield of secondary ions. This technique is used for "bulk" analysis of elements and isotopes, and is particularly well-suited for analysis of isotopes and trace elements in minerals (e.g. REE in garnet). Alternatively, "static SIMS" uses a much lower energy primary ion beam (usually Ga or Cs). 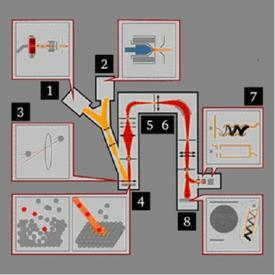 This technique is typically used for analysis of atomic monolayers on material surfaces to obtain information about molecular species on material surfaces (e.g. organic compounds; see module on Time-of-Flight SIMS. Secondary Ion Mass Spectrometer (SIMS) Instrumentation - How Does It Work? the electrostatic filter reduces the energy range of the secondary ions so that they can then be separated into independent ion beams (based on the charge/mass ratio) by passing them through a magnetic field (magnetic sector). In this configuration, multiple ion beams can be measured simultaneously. If the magnetic sector precedes the electrostatic sector (reverse geometry), then mass resolution is improved at the cost of losing the ability to measure multiple ion beams simultaneously. Other types of mass spectrometers can be coupled to the SIMS source, including quadrupole and time-of-flight analyzers. These latter configurations have fewer applications in the geosciences. Smaller radius, double focusing instruments offer very high sensitivity (detection limits) for trace element analyses, roughly 10x the sensitivity of microprobes that utilize beams of electrons (e.g., Cameca IM 7f). These instruments can also used to "map" the distribution of individual elements in a sample. 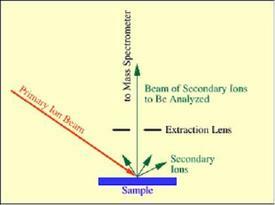 Strengths and Limitations of Secondary Ion Mass Spectrometer (SIMS)? The analysis consumes very little sample (essentially non-destructive); for example, a typical U-Th-Pb analysis only consumes a few cubic micrometers of sample. High sensitivity also means that samples with low concentration levels (down to ppb levels) can be analyzed with SIMS. As a result, the SIMS is used to determine trace element abundances in meteorites, interplanetary dust, and other samples of limited size and are widely in the semiconductor industry to identify trace constituents in non-conducting substrates. High sensitivity also allows for depth profiling of elemental and molecular abundances as well as isotopic ratios. In situ analysis eliminates the need for complex sample preparation in most cases, i.e., minerals may be analyzed directly either as grain mounts or in thin sections. Because both atomic and molecular species are produced during sputtering of the samples, not all elements in all substrates (matrices) can be analyzed quantitatively. For example, Lu-Hf in zircon is plagued by unresolvable isobaric (equal mass ions) interferences that cannot be overcome by either forward geometry multi-collection or reverse geometry high-resolution instruments. SIMS instrumentation tends be expensive, with typical instruments costing $2-3M. As for all geochemical analyses, care must be taken to preserve sample integrity from the time of collection through analysis in all steps of physical and chemical preparation. In SIMS, care must be taken in the physical preparation of the sample prior to analysis. For SIMS the sample surface must be highly polished (~1 micrometer) and coated with a conducting, pure metal (particularly for non-conducting specimens) to avoid charge buildup on the surface. Failure to do so that can alter the behavior of the analyte ions and lead to erroneous results. Quantitative isotopic and elemental data from this technique must be derived by comparing measurements of unknowns to well characterized standards. A key aspect of producing accurate, reproducible results, therefore, is identification and utilization of appropriate standards. For example, U-Th-Pb dating of zircon requires alternating analyses of unknown zircons with standard zircons in order to determine accurate U/Pb ratios and ages. Hervig, R. L., Mazdab, F. K., Williams, P., Guan, Y., Huss, G. R., Leshin, L. A. (2006) Useful ion yields for Cameca IMS 3f and 6f SIMS: Limits on quantitative analysis. Chemical Geology, 227, 83-99. Hinton, R. W. (1995) Ion Microprobe Analysis in Geology. IN: P.J. Potts, J.F.W. Bowles, S.J.B. Reed, and M.R. Cave (eds), Microprobe Techniques in the Earth Sciences. Chapman and Hall, pp 235-290. 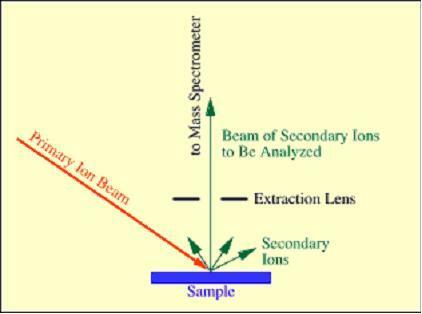 De Laeter, John R.(2001) Mass spectrometry (including SIMS, ICP-MS, Accelerator MS, TIMS) Applications of inorganic mass spectrometry, John Wiley & Sons, New York, 474pp. Swart P.K. (1990) Calibration of the Ion Microprobe for the Quantitive Determination of Strontium, Iron, Manganese and Magnesium in Carbonate Minerals. Secondary Ion Mass Spectrometry: Basic Concepts, Instrumental Aspects, Applications, and Trends, by A. Benninghoven, F. G. Rudenauer, and H. W. Werner, Wiley, New York, 1987 (1227 pages). Page FZ, Ushikubo T, Kita NT, Riciputi LR, Valley JW (2007) High precision oxygen isotope analysis of picogram samples reveals μm gradients and slow diffusion in zircon. Am. Mineral. 92:1772-1775. Kelly JL, Fu B, Kita NT, Valley JW (2007) Optically Continuous Silcrete Cements Of The St. Peter Sandstone: Oxygen Isotope Analysis By Ion Microprobe And Laser Fluorination. Geochem. Cosmochim. Acta. 71:3812-3832. Cavosie AJ, Valley JW, Wilde SA, EIMF (2006) Correlated microanalysis of zircon: Trace element, δ18O, and U-Th-Pb isotopic constraints on the igneous origin of complex >3900 Ma detrital grains. Geochim Cosmochim Acta 70: 5601-5616. Valley JW (2001) Stable Isotope Thermometry at High Temperatures: In: Valley JW and Cole DR (eds). Stable Isotope Geochemistry, Reviews In Mineralogy and Geochemistry, vol. 43, p. 365-414. Valley, J. W., Graham, C. M., Harte, B., Kinny, P., and Eiler, J. M. (1998) Ion microprobe analysis of oxygen, carbon, and hydrogen isotope ratios. In: McKibben, M.A., et al. (eds), Soc. Econ. Geol. Rev. in Econ. Geol. 7, 73-98. Eiler, J. M., Graham, C., and Valley, J. W. (1997) SIMS analysis of oxygen isotopes: matrix effects in complex minerals and glasses. Chemical Geol. 138, 221-244. Valley, J. W. and Graham, C. M. (1991) Ion microprobe analysis of oxygen isotope ratios in metamorphic magnetite-diffusion reequilibration and implications for thermal history. Contr. Mineral. Petrol. 109, 38-52. SIMS Facility -- Sandia National Laboratory and University of New Mexico; Basics explained and Trace Element Analysis. 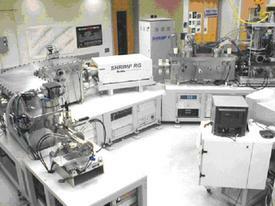 UCLA SIMS Facility -- including information about sample preparation, U-Pb tutorial. USGS- Stanfard SHRIMP-RG Facility -- sample preparation, applications, research results. Teaching activities, labs, and resources pertaining to Secondary Ion Mass Spectrometer (SIMS).